This article was initially conceived as a paean to the park bench as emblem and occasion of informal sociability. 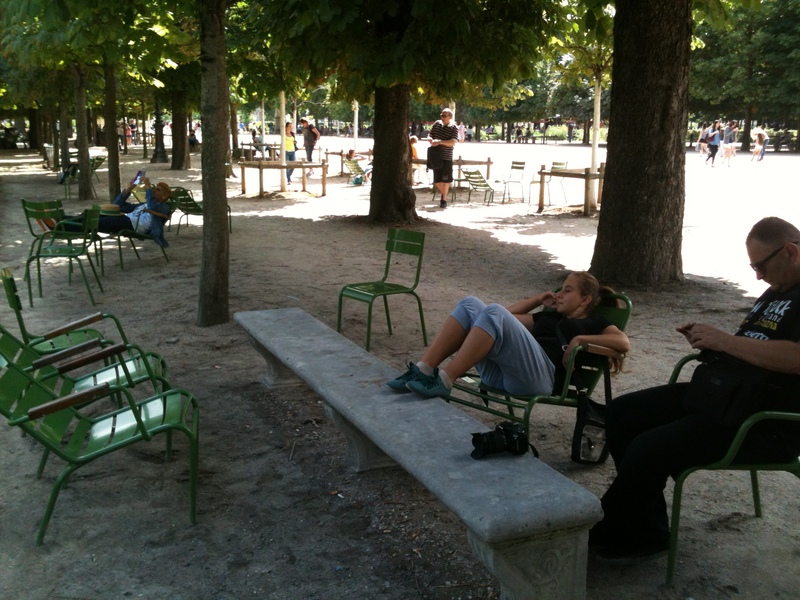 Enthused by a visit to some parks in Paris, and being delighted by the seats (more anon) seen there, I was going to make the argument for similar seats here in the UK based on the view that they could help enhance the sociability of the public realm, complements to the traditional park bench. 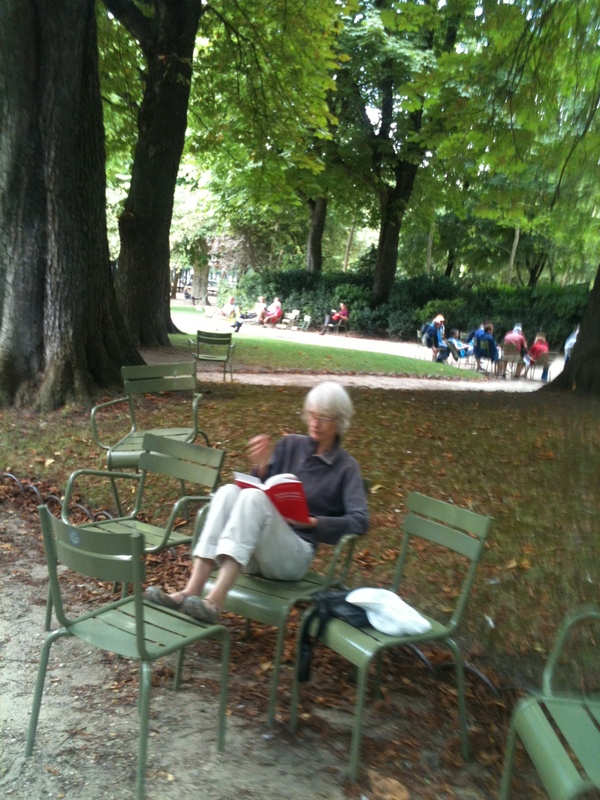 But a little thought made me see that I was wrong about the connection between park bench and sociability – too simplistic, seeing what I wished to see, and not what was there. So, now I wish to promote those very same seats, but for different reasons. But first, park benches. ‘Park benches are set as seating places within public parks, and vary on the amount of people they can seat’, so says Wikipedia in an offering unlikely to arouse controversy. 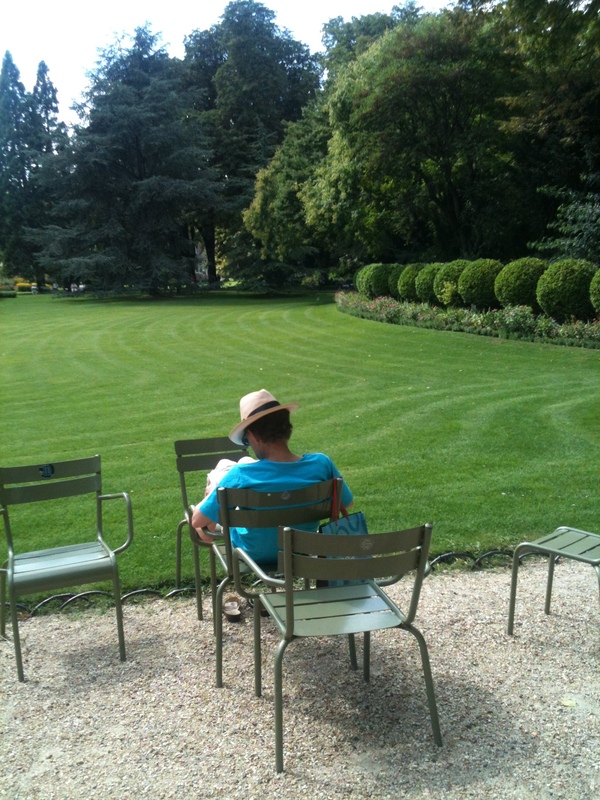 A bench, then, always offers space for more than one, otherwise we would call the sitting place a ‘seat’ or ‘chair’. Yet, oddly, park benches are not very sociable places – we tend to head for an empty bench if wanting a break from our leisurely perambulations; and when there is no option but to sit on an already occupied bench, we may – just may – acknowledge our now co-sitter with a nod, a word, a smile. But otherwise silently wish them away. And they are probably having thoughts not dissimilar. Of course, if we are with friends or family we will sit and converse with them. But otherwise, whether we are one alone, or with friends or family, we want the park bench to ourselves. Our unwished for co-sitter has acquired the status of intruder – and this in a space we have no right to think of as our own. “Conversation-shy Brits would rather pack up and go if they are joined on a park bench by a stranger, research has revealed. “The nation is home to millions of park benches but sitting down unleashes territorial feelings and a staggering 41% of us admit we would leave within five minutes if someone sat down next to us. 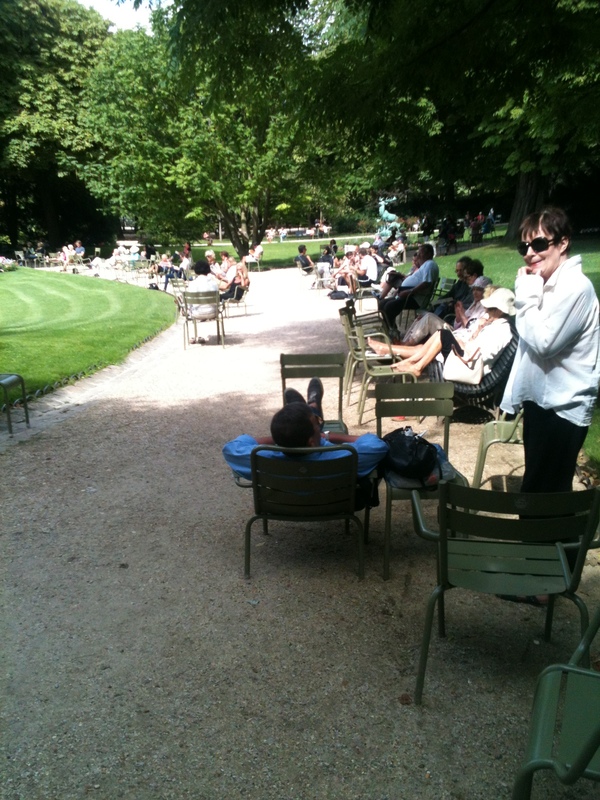 By way of contrast, we are generally pleased that people – strangers – are in the park with us. In part for the reassurance that the presence of others brings, in part because other people are gentle feasts for our eyes: people watching is free, freeform theatre. Our response to the park bench, on the one hand, and to the park on the other, seem to be in gentle tension with each other, pulling in different directions. The one wishing for the expulsion or at least non-presence of the stranger; the other, pleased at their presence, perhaps requiring it. Park benches, then, do not often or easily prompt expressions of sociability, quite the opposite. Just to confirm, I love park benches. On a sunny day, that is where you will find me perched. But they could do with augmentation. So let us turn briefly to Paris. The pictures – admittedly not of the highest quality – I took them, speak for themselves. 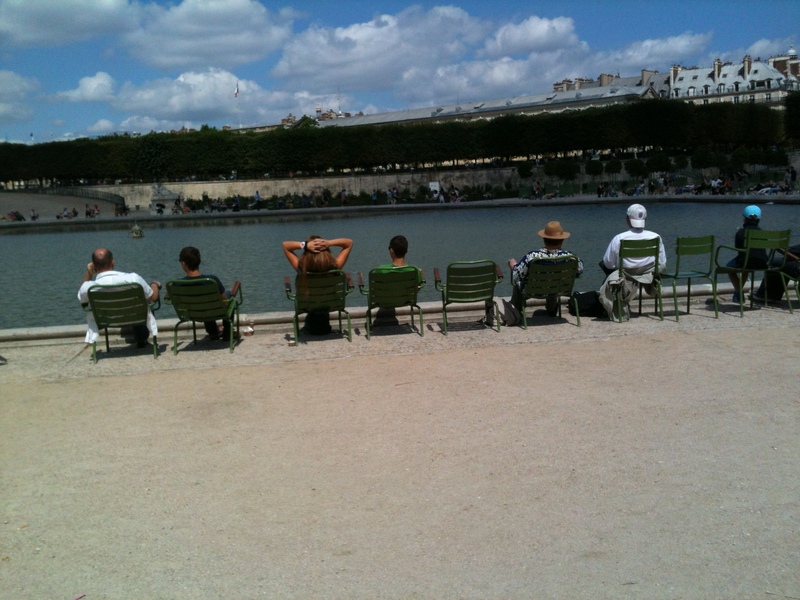 These seats – unlike park benches – are not our masters determining where and how we will be, but prospective collaborators, waiting to respond to our individual wiles and wishes. Flexible friends, enabling us to be with others, or to be alone. And, implicitly, they take account of that appendage disregarded by the conventional park bench: the leg. See here in some of the photos how the desire to stretch, to raise the leg, can be accommodated. The only was to ease or stretch one’s leg on a conventional park bench is by infringing the unspoken conventions associated with it: sit, do not lie. Each day, each hour perhaps, these seats populate the park in different ways. The seats have backs, and often armrests – welcomed by people as they get older. My initial thought was to promote their use in UK parks on the basis that they enhance informal sociability, but that outcome is by no means assured. Rather, the justification is that they are responsive to park users, they allow both solitariness and groupings of different numbers and configurations. In Paris, they are also free. We should have them here. 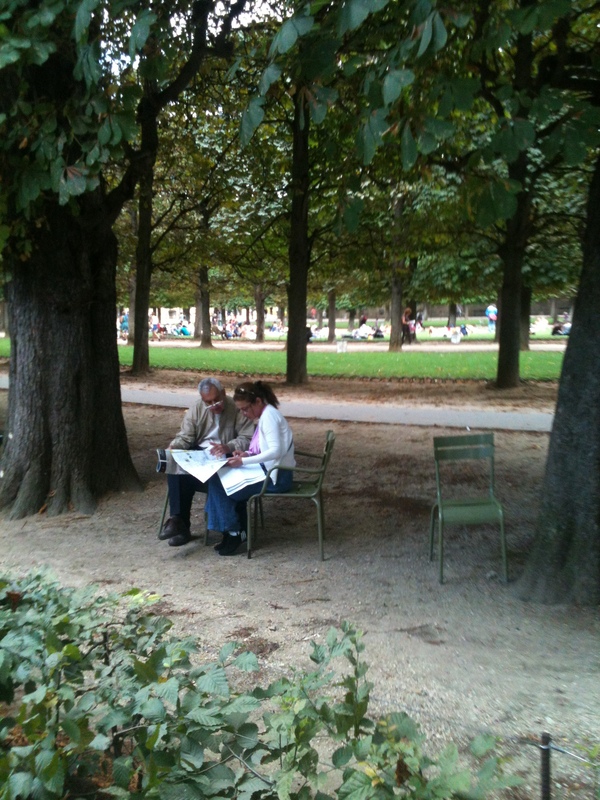 This entry was posted in parks and tagged informal sociability, Paris, park benches, parks. Bookmark the permalink. Thanks for making me smile, Bernard! I wont be the one to start on the negatives of moveable seats vs bolted down benches. Someone else can do that. I agree that in France it is a bonus that such offerings are available to the casual park visitor. 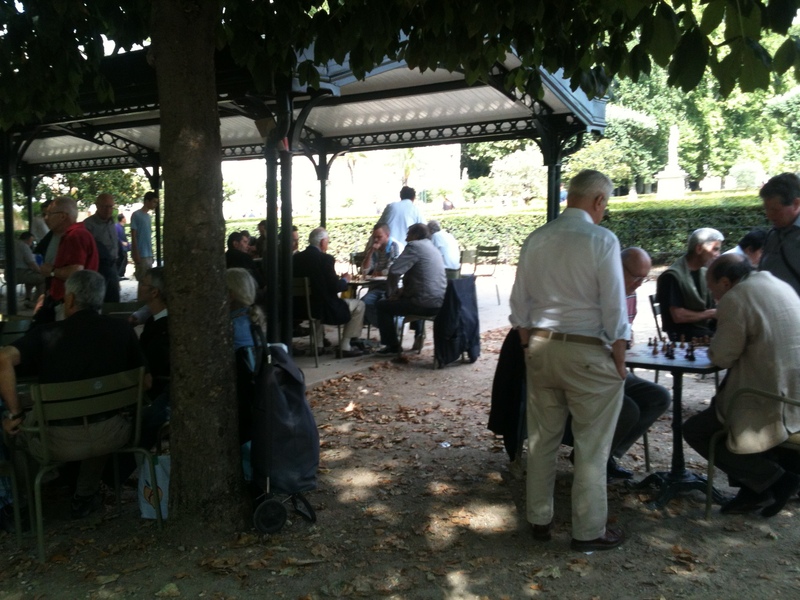 I’ve been in lots of French city and town parks over the years and they all seem to have the same view on what the visitor wants. I recall also seeing the same arrangement on the Croisette (beach promenade) in Cannes, with the deckchair being the UK version, I guess? Perhaps that’s partly why, in my role a few years ago as a parks officer for Wycombe Council, I did put a little thought into the benches vs seats question. What I came up with was the setting out of some park benches in C shaped groups (others were positioned in more standard rows facing the nicest views) that met the needs of teens (more particularly the girls) as well as older folks, who also seem more prepared to chat to `strangers’, for seating that enabled one to look at, as well as speak to, one’s companions. The info that encouraged me to try this experiment came from park survey data commissioned by me as part of a redevelopment project, as well as from my own observations of the people that used the park on a regular basis. The bench layout seemed to be a reasonable success. Would a scattering of chairs have worked in the same way? I doubt it, as anything not securely bolted down into three feet of concrete inevitably ended up in the River Thames. Oh, now I’ve started on the negatives, when I said I wouldn’t…. Neil, yes, experimenting with different configurations of fixed seating is be worthwhile. But I’m prepared to let go of my enthusiasm for the sort of individual, movable seats that my original article discussed. I can see that there will be some locations where they would not work for the reasons you suggest; but in many parks, not least ‘destination’ ones, there is no reason to suppose that British park visitors are more inclined than French ones to fling chairs around.